Development of folk dance in villages was not an isolated process. Folk clothes were important for the modifications of traditional folk dances in the Zemplín region. For example, dances for women there were influenced by the increasing amount of underskirts in the 20th century. Girls in the Zemplín region wore from 10 to 15 underskirts after the WWI. Dance movements had to be adjusted to such weight. The length of top skirts was usually up to a half calf, or up to an ankle, with bell-shaped silhouette. Top skirts were narrower, with plissé or folded and with less underskirts in the 1950s. The change of silhouette of folk costume modified and emphasized the dance. Rotating of a female dancer disappeared first as the narrow silhouette of folk costume changed the movements. Male top tight-fitting trousers from home-made twill were determined for rhythmical movements of dancers. Young dancers had spurs on boots which made specific sound while dancing. Male folk costume was replaced by ordinary trousers in the 1940s. Boots and spurs were replaced by ordinary shoes. Traditional clothes of young males disappeared after the WWII. Changes in clothes simplified folk dance movements. 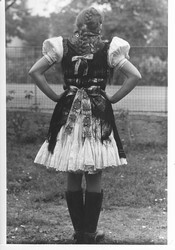 Female folk costume disappeared among young people in the 1960s. After the WWII, men started to wear suits. Suits were replaced by jeans, T-shirts and sneakers in the late 1970s. Major differences between clothes of both genders have disappeared which helped to dissolve gender differences in dance of males and females and regional and local dancing styles to disappear.